Externalization preceding Merge: On this view, even the simplest conceptual units were externalized from an early stage in hominid evolution onwards (confer Bickerton’s protolanguage). This means that merge would have been public from the start. The other possibility is that the capacity to merge conceptual units for advanced thought precedes externalization and public communication. In normal humans it is important to note that complex thought and complex language go together. There are of course pathologies where they are dissociated but overall there is a lot of evidence that there is a correlation between verbal and noverbal IQ, that learning simple public labels modifies thought, especially in children, that bilinguals perform better in certain tasks, and that words can function as and aid to thought. This suggests a less simple possibility: A coevolutionary spiral of successively more complex language and more complex thought. This also means there can’t have been only a single mutation: The grammatical system and the system supporting it (storage capacities, working memory, vocal manual skills, pragmatics, etc.) are highly interdependent. They all had to evolve in partnership. Hurford closed his talk by discussing the question whether evolution has produced a new unique domain. Hurford stresses that our evolved capacities for language have built on pre-existing capacities for, e.g. “So the conclusion is mixed: The wondrous recursive creativity in language is not as special as it is often claimed to be. Nevertheless language is a special system because of what is does and the particular structural materials it uses to do it” (Jackendoff 2007: 143, see also Hurford 2011: 510 ). In this perspective language was shaped by and adapted to the organization principles brain, and it is normal development and the connectivity patterns. Language, then, becomes more similar to other highly specialized neural systems like chess or driving (Karmiloff-Smith 1992). Thus, general cognitive capacities and constraints (e.g. constraints from the conceptual system, pragmatics, learning and processing mechanisms, perceptuo-motor factors and others, cf. Christiansen & Chater, 2008) and their interconnectivity might play a more crucial role than Hurford gives them credit for. So the jury is still out whether the interconnection and co-optation of domain-general processes alone can explain language acquisition and use, and this is a highly active and exciting area of research (see e.g. this paper published a couple of months ago in a special issue on “Pattern perception and computational complexity“) that plays a fundamental role in answering the question of what is wrong, and what is right in language evolution research. I had a very similar conversation to this with a cognitive linguist I met while manning the Culture Evolves stand at the British Science Festival last week (I’ve directed her here – hello if you’re reading!). A lot of the same issues came up. It was the first time I’d thought about them in this sort of frame, and I found her perspective really helpful when I thought about it later. I tend to side more with Jim on this one; children, when immersed in a chess-playing or car-driving environment, don’t seem to have dedicated cognitive architecture for acquiring those skills without explicit instruction – and especially not from infancy. Clearly, our communicative and social cognition is a different sort of animal in this regard – there hasn’t, as yet, been a critical period identified for the acquisition of chess, the capacity for which (I assume) tends to decline at much the same rate as any other skill. I’d say this speaks against language competence being attributable only to neural reuse, which can really only describe the manner in which we acquire skills within pre-existing constraints. I’m not entirely on board with this sentiment; the specialised capacities that allow – nay, compel – infants to exploit the ‘symbolic niche’ are the result of selection over phylogeny. The extent to which the symbolic environment shapes this dedicated architecture is certainly a matter of ontogeny, but I conceive of this as operating within the pre-existing domain rather than creating it. This opinion is perhaps biased because we can watch language adapting to the brains of the users in cultural evolution experiments much easier than we can compare the different ways in which brains adapt to symbolic environments, which emphasises the massive constraint cognition has on what the symbolic environment looks like. I’m enjoying the Poznan coverage, Michael. Thanks for taking the time to do it. I struggled a bit with how to phrase “the alternative position” and I’m not sure if I did a very good job at presenting it. Chess and driving probably aren’t very good examples, “action syntax” and “social hierarchies” might be more fitting, for example. Whether there is domain-specific “dedicated architecture” for language acquisition and processing is of course one of the key controversies in cognitive science. In the view of “language being shaped by the brain”, there might not be any need for a innately specified dedicated architecture selected for over phylogeny if language(s) evolved and are constrained in such a way (e.g. by constraints from the nature of thought, constraints arising from the perceptual and motor machinery underlying language, cognitive constraints of learning and processing (, and pragmatic constraints, as proposed e.g. by Christiansen & Chater 2008) that it could be manipulated, processed, and learned by domain-general processes that interact and become interconnected in such a way as to create a dedicated linguistic system in ontogeny. There might of course be certain constraints and biases which “channel” development in such a way as to create this “dedicated architecture” and one might speak of some form of “Architectural” instead of “Representational Innateness”, but as Jim said when I discussed this with him, this might be more of a matter of terminology. In acknowledging the possible role of certain biases and constraints in “channeling” or “facouring” the ontogenetic development of the linguistic system, I think I agree with Jim (and you) to some extent. 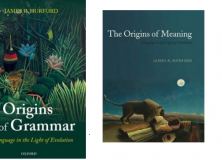 Previous Previous post: Jim Hurford: What is wrong, and what is right, about current theories of language, in the light of evolution?